Why measure organisational safety performance? You rely on your safety management systems to protect your business. If you don’t know how well these systems are performing, you don’t know if you are protected. Part of the suite of Baines Simmons’ SMARRT® tools, SMARRT MAP-MI (SMARRT Measurement and Assessment of Performance Maturity Indicator) is an exclusive, high-level, self-assessment tool that helps you to measure and assess your organisation against our SMARRT MAP™ model which we have developed to illustrate the management of safety at an organisational level. 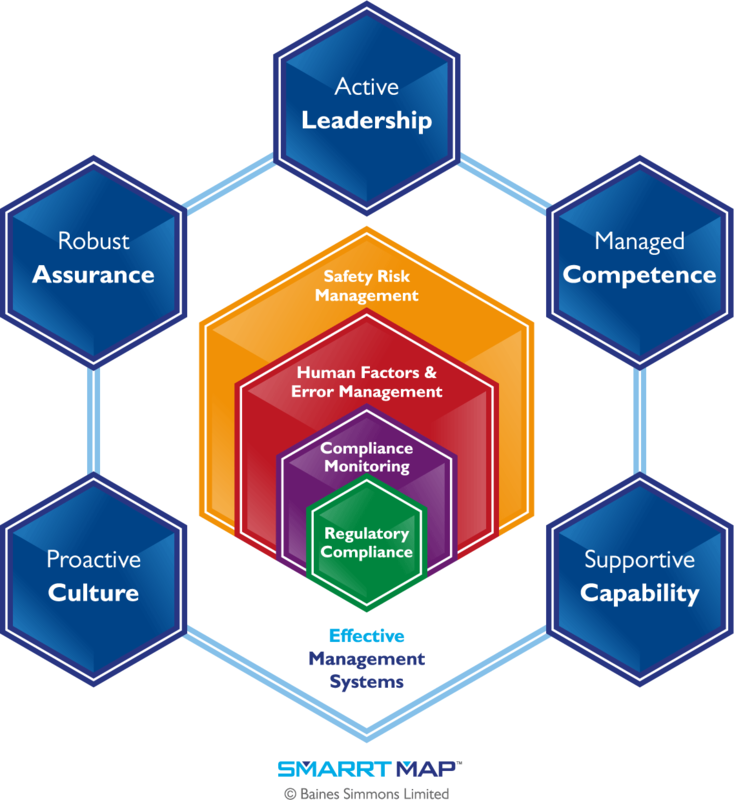 Our SMARRT MAP™ model illustrates our approach to managing organisational safety performance. It is people-and system-centric and focussed on the ‘human in the system’. SMARRT MAP™ comprises four core safety management systems and five key performance enablers. It will help you to identify your areas of strength as well as assist you to prioritise areas for focus and improvement. What will you get from a SMARRT MAP-MI assessment? On completing the self-assessment, you will receive a high level evaluation of your organisation’s safety performance. It will include an explanation of your maturity levels and some considered prompts on how you can progress your systems and enablers to achieve greater levels of performance. You will also see how you benchmark against your peers in the aviation industry. NOTE: As a self-assessment tool, results shown will be indicative in nature and will vary in its accuracy according to each organisation’s unique circumstances. SMARRT MAP-MI’s purpose is informational and intended to help stimulate thinking on how you can consider maturing safety management performance in your organisation. SMARRT MAP-MI is a free-of-charge and confidential service. Simply register an account to get started. To learn more about SMARRT MAP™ or about our approach to safety performance please click here. Alternatively email consulting@bainessimmons.com or call on +44 (0)1276 855 412 to speak to one of our consultants. Register your details to complete the online self-assessment. Once complete, you will receive a summary of your answers along with a visual representation of your organisation’s current levels of performance across all areas of the SMARRT MAP™. Your results will be saved to enable you to maintain a record of your past assessments and monitor your organisation’s progress over time. Please answer the questions based on your current, rather than desired state. While it is possible to complete the assessment independently, in order to understand your current status fully, we recommend you consider undertaking a team approach to your assessment. Members of your Safety Action Group or Safety Review Board are ideal candidates. SMARRT MAP-MI is designed and intended for informational and guidance purposes. It illustrates potential achievable states of safety performance with some suggested prompts for next steps. However, actual results may vary significantly for a variety of circumstances. For clarity, Baines Simmons makes no assurances or warranties of any kind here whatsoever. * Please note that Baines Simmons uses an expanded 5 level version of this scale to recognise organisations that are exceeding effective performance and are considered industry-leading.